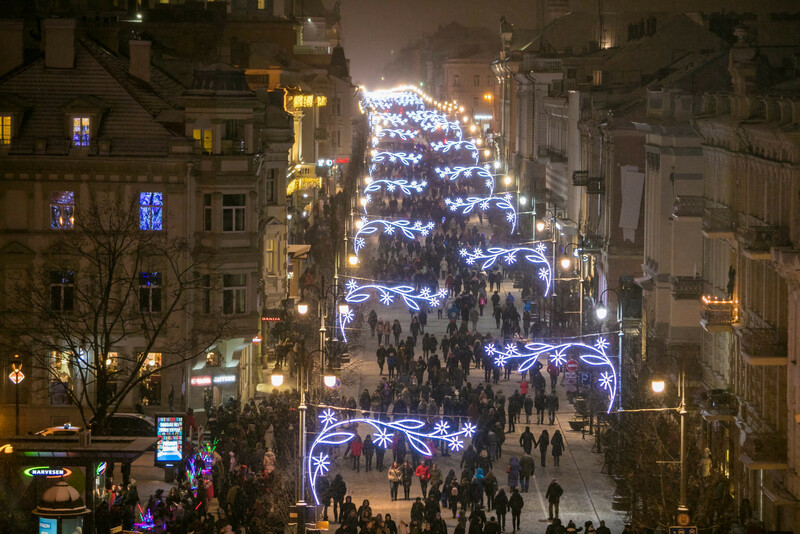 “Christmas in Vilnius” is the largest and most impressive festival of the capital of Lithuania. This is five unforgettable weeks of winter holidays in Vilnius, where the variety of festivities and pleasant Christmas surprises in the capital make Vilnius the true Christmas capital. 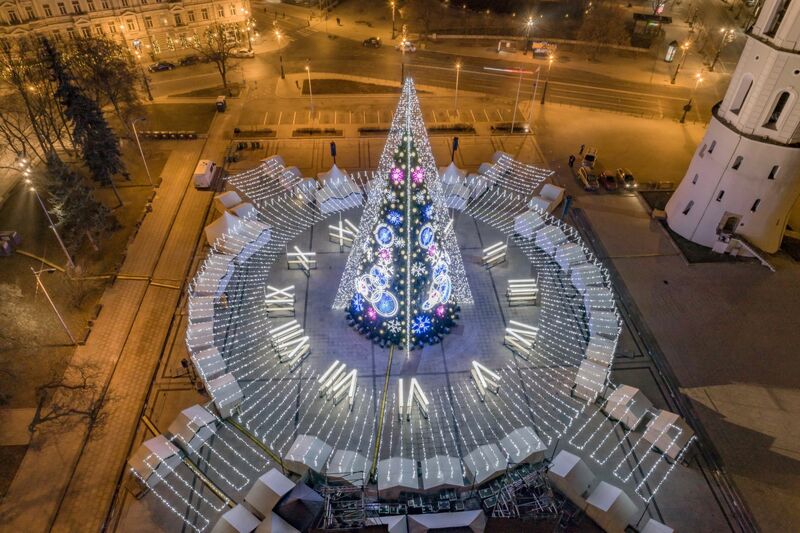 The Christmas tree on the Cathedral Square become the pride of Lithuania and the celebrity of the whole Europe for several years in a row. Last year European travel portal “Europe Best Destinations“ elected the Christmas tree of Vilnius the most beautiful in Europe, and one of the world’s leading travel portals from the US “Conde Nast Travaller“ included the Christmas tree of Vilnius in the list of the 15 most beautiful Christmas trees in the world. The Christmas towns in the Cathedral and Vilnius Town Hall squares create a speacial festive mood in the heart of Vilnius Old Town and offer a show of remarkable Christmas beauties and goodies. A special holiday tradition in the Lithuanian capital has become the Vilnius Christmas Train, which turns festive circles around the center of Vilnius and a unique 3D projection of a Christmas Fairy Tale, which is displayed in all its vivid colours on the main outside wall of Vilnius Cathedral on evenings of 25–29 December. New Year’s Eve, the Cathedral Square full of the residents of Vilnius and guests of the city welcome the New Year with colorful festive fireworks. On 6 January, the end of the “Christmas in Vilnius“ announce the traditional playful “Three Kings” procession. 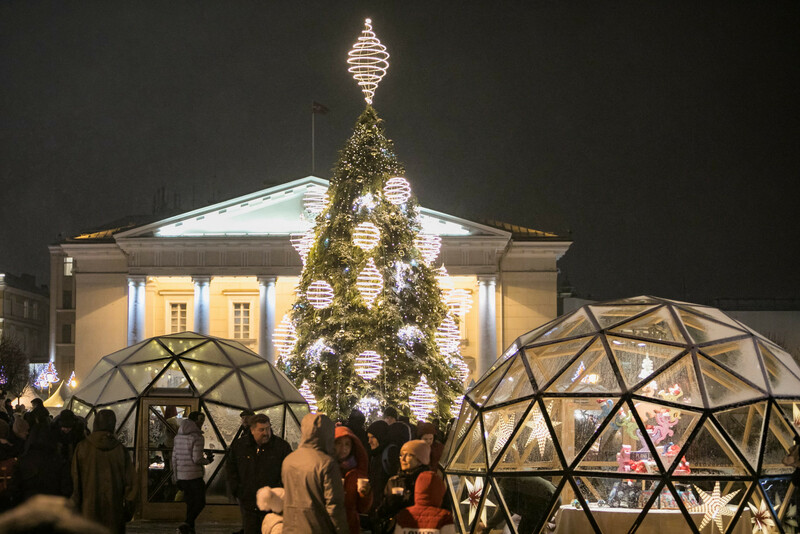 “Christmas in Vilnius” pleasantly surprise the residents of Vilnius and the guests of the city with new ideas and special celebrations every year. Come and become a part of “Christmas in Vilnius”! 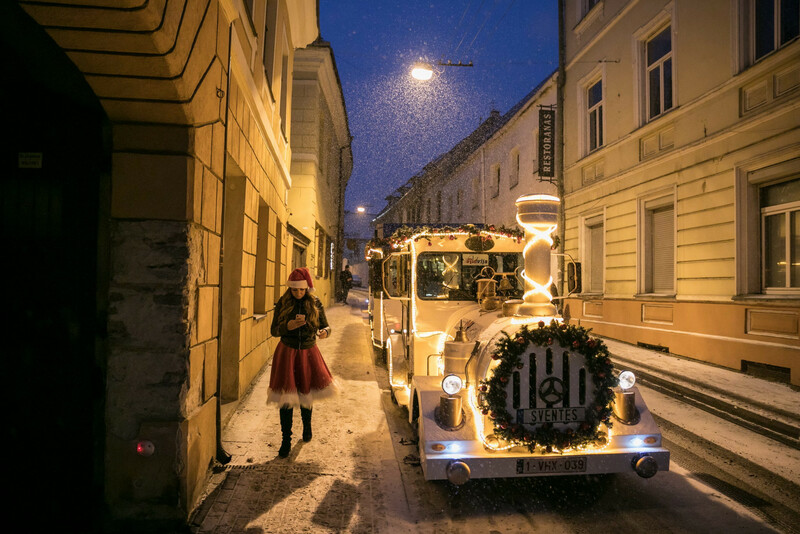 The Vilnius Christmas Train has become somewhat of a holiday tradition in the Lithuanian capital, and we would love it if you were to join us for a ride around what promises to be a festive Vilnius! The train “station” is located at a special stop opposite Cathedral Square. The Vilnius Christmas Town is the bustling Christmas Market held at Cathedral Square. Nowhere in Vilnius is the holiday spirit more alive than here. Over 50 cosy decorated wooden Christmas Market houses are filled with seasonal treats and various handmade gifts. We are certain that you will be able to find a special Christmas gift for your loved ones at the Christmas Market. This year, Vilnius residents and city guests will also have the opportunity to purchase various souvenirs and holidays gifts at yet another Vilnius Christmas market, this one operating at Town Hall Square. 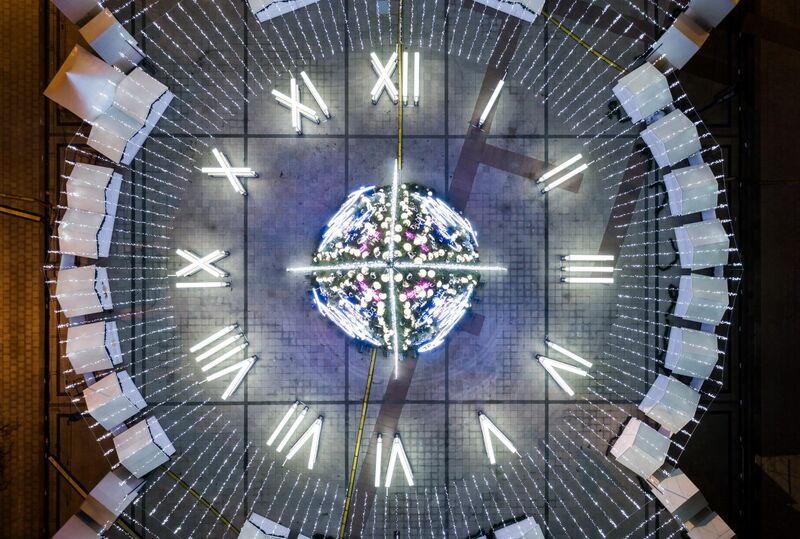 Christmas celebrations will invite you in the changing district of Vilnius Railway Station. The cycle of events FESTIVE STATION – INDEPENDENT CHRISTMAS TOWN will start on 30 of November. There will also be street food markets in the festive Independent Christmas town, where the chefs will produce food, performances of music performers, creative workshops will be organized. In the main hall of the Vilnius Railway Station will take place the Christmas Fair. Admission with rented skates is 3,00 euro for a session. Admission with own skates is 2,00 euro for a session. On Sunday, 9 December, from 12 a.m. – the feast for the whole family “Hello, dear Santa Claus!” on the Cathedral Square. Santa Clauses from all five regions of Lithuania are coming to Town. It will be great to see the oldest one – the Santa Claus of Čepkeliai and the youngest and most stylish Cutie from Suvalkija, and others. Santa Claus of each region will present what is most characteristic of his region during the Christmas period: games, songs and dances. Afternoon concerts will be held on Thursdays and Saturdays from December 13 to December 29, and the final concert of the cycle will be played on the last day of the year – December 31, Tuesday. Each concert of the cycle is a rare opportunity to listen to the most beautiful works of organ music from the world treasury of Christmas music. Duration of the concert – about 25 minutes. The entrance is free. The Vilnius Christmas Run has been part of our holiday season traditions since 1975! An event for the whole family, participants can choose between a 3 – kilometre run, a 6 – kilometre run, or if you’re feeling really brave, you can opt in for the 12 – kilometre run. For our little runners, we also have a 200 – metre “Elves run”. 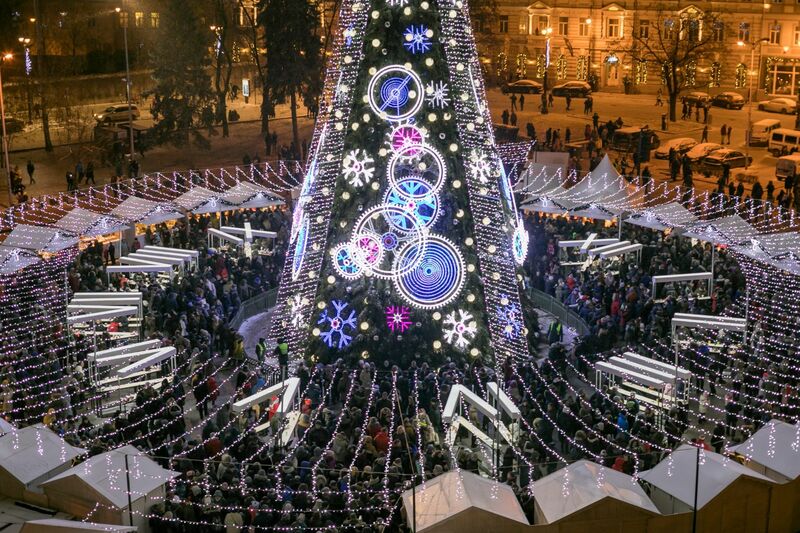 The Christmas Design Square is one of the trendiest holiday events in Vilnius! Already a firm favourite among local designers, the Christmas Design Square invites locals and guests to purchase Vilnius-made gifts for their loved ones, and meet the talents behind these creations that are unique to our city! The Christmas Eve Mass will take place inside the Basilica of Vilnius Cathedral, and we invite you to come and experience one of the most important religious events on the Lithuanian calendar! The 3D Fairy Tale is the biggest Christmas attraction in Vilnius, with over 120 000 visitors each year. A unique 3D projection of a Christmas Fairy Tale is displayed in all its vivid colours on the main outside wall of Vilnius Cathedral. Please come and take part in the Christmas fairy tale of Lithuania’s Capital city! New Year’s Eve is a time to celebrate the end of the year and welcome what’s in store for the New Year. Anticipating and welcoming the New Year is a beloved Lithuanian tradition. At the stroke of midnight, between New Year’s Eve and New Year’s Day, Vilnius will celebrate with a festive fireworks show. The Christmas period ends with the Epiphany holiday (6 January), which commemorates the three kings (Gaspar, Melchior and Balthazar) who visited baby Jesus. The events of the end of festive season in Vilnius will start near the Gates of Dawn at 16:30. The parade of the three kings’ effigies will take place the city streets and will end with a traditional performance that includes placing a crib at Cathedral Square. The final event of the Christmas period will be marked by saying goodbye to the Christmas tree in the courtyard of the Teachers’ House (Mokytojų namai, on Vilnius Street) at 18:00. The occasion is not just a way of bidding farewell to one of our city’s best-loved Christmas icons, it’s also a way of celebrating the end of the festive season, and a sign for all of us to get on with the new year. The seventh of January, the Russian community of Vilnius, the representatives of the Orthodox traditions invite adults and children to the feast of the Nativity at the Christmas tree in the Cathedral square. They will celebrate the Orthodox Christmas. For the residents and guests of Vilnius will host a big concert. For young participants of the festival the organizers will arrange games and hold dances. Guests of the festival will meet a Grandfather Frost and Snow Maiden. Beginning of the event 16:00. We’d love it if you would be able to join us!